The Church Now Has Doors! The Church With Doors! – Below is a post that explains how and why the front doors of the church needed to be repaired. 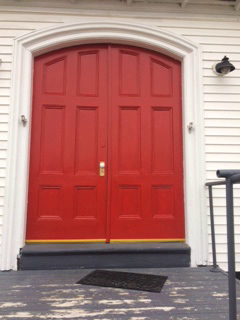 This post is titled, “The Church Without Doors.” As these pictures show, the doors are back and are now a bright red! Looks like the “Welcome Mat” is also out!! The church appreciates the work of Tim Deschiffart and his crew for their workmanship on repairing the doors and Peter Duston for coordinating the work. A special thanks to the Maine Community Foundation and the Belvedere Fund for Historic Preservation for financing the work through the grant the church received. This made the work possible! 🙂!